Today Mastfun4u has decided to provide the most attractive Jpstation blogger theme to you in this post. when I created a complete blogger course for the sake of make money online then a lot of my followers asked me to publish any beautiful and attractive theme, therefore I have decided to provide jpstation blogger template to you, and the snapshot is shown below, this blogger template may be used for articles blog as well as form Videos, as you might have seen at Facebook the people share the video which redirects to websites like this. so this may be used for any kind of topic you use for. Remember me in your prayers. 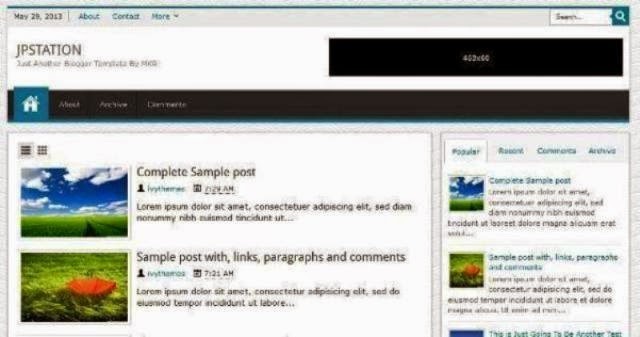 When we say Responsive Template in case of blogging it means that a website design with all kind of previews like the same theme will be opened in mobile style when it is opened in mobile, the same will open as tablet style when opened in tablet and same will be opening in computer style when it is opened in PC. I am sure you have been familiar with templates now you can use this template as your personal website template. Norin, What do you mean by domains searching. please write some details. sir ek template dhoondh rha hu bahot dino se koi acha nahi mil raha aap kuch btaiye blogger template ke liye pls sir ek acha sa template free provide karaiye please. If your account is approved then no issue should occur, ads does not show instantly they may take few minutes. Nahi dear ap is cheez ko ignor kar dein. Please also tell how to make about, contact, more in your suggested jp station template. Dear I have explained but the video is in urdu/hindi language. Try to add html pages into Wordpress blog. or write your question clearly. sir i like sora red blogger template.plz upload tutorial video for that,i would be very thankful. Preeti, It makes no difference what template you upload, the customization process is same, First of all create a new blog with some post (doesn't matter if contents are copied because this is just for test). Ye template full modified hai aur bilkul simple tha. Sir i tried to apply sora red template to my site. few things are happening not all as i am a non technical person in this field. how to deal with it. Give me the link where you tried this template and did you keep a backup? sir your reply is awaited. i tried all the methods which i knew but post are not displaying according to the choosen template. I wish I could make a tutorial about sora red template editing but unfortunately I am busy these days but in few days I will do it. Dear is template me to read more ka option hota hai. Sir, if i remove the credit link from the template. Is there any problem? You can hide but not remove. Do not take others credit. Sir, why you write "powered by blogger" in your footer? Explain me your reason. It is not essential, you can keep it or remove it. asalam o aliakum bhai yr blogger me templete kese aate haiin koi tarika btao...??? Could you please make a video about how can we protect our blogger from copyright? This a request. please make this video or blog as soon as possible.